Just as every snake has its own unique characteristics, not every car insurance company is the same. The larger auto insurance companies have local adjusters and lawyers who work exclusively for them known as “captive counsel.” These people are employees of the company whose job is to minimize your claim and thereby minimize the amount the company pays out. Smaller and medium-sized insurance companies often are not large enough to have an adjuster in every city or a law firm on the payroll in every town. There are a number of ways the smaller and mid-sized insurance companies handle claims that range from in house adjusters to contracting out claims to independent claims adjusting companies. It helps to have an attorney who is familiar with the insurance company handling your claim and how it is set up. This knowledge may play a role in determining the best way to pursue the claim. It helps to be familiar with the company and its specific claims adjusting tactics before you try to pursue a car accident claim. Must I Hire an Attorney After a Car Wreck? You do not have to hire an attorney following an auto accident. However, if you suffered more than just property loss in a very straight-forward accident, you are taking a great risk by not hiring an attorney who handles car accident claims. Insurance companies put their claims adjusters through extensive training. Their primary role is to reduce the loss exposure for the company. 1) You should never give a recorded statement without your own attorney present. 3) They will usually not pay your bills as you go. They make you front the money for all of your care and then offer you a settlement at the end once your finances are stretched thin. They know you are less likely to seek care timely if you are struggling financially. 4) If you settle your claim against the other driver without getting permission from your own first-party insurance carrier, you may be waiving your right to make an underinsured/uninsured motorist benefit claim. Also keep in mind that they have lawyers on staff advising them as needed on how to minimize your damages. Knowing this, wouldn’t it be wise to have a lawyer advising you along the way? Discuss your case with you and let you know what to expect for the company you are dealing with. Help you obtain the medical care you need if you do not have affordable access. Answer your questions along the way. Pay the up from costs of ordering bills and records, filing a claim and even a lawsuit if necessary. Charge you no attorney fees and no expenses unless we make a recovery for you. Call us for a free consultation today at: 713-932-0777. Is a Verbal Release Given to an Auto Insurance Adjuster Binding? What are Auto Insurance Policy Exclusions? What is Covered By a Texas Liability Auto Insurance Policy? 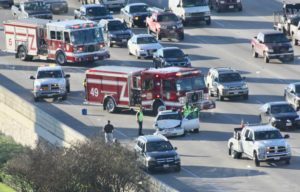 What Texas Laws Pertain to Hit-and-Run Accidents? Who is at Fault For a Sideswipe Accident? Who is at Fault for an Intersection Collision? Will Automobile Liability Insurance Cover Intentional Acts?